Bohol is divided into the main island Bohol and the Peninsula Panglao. 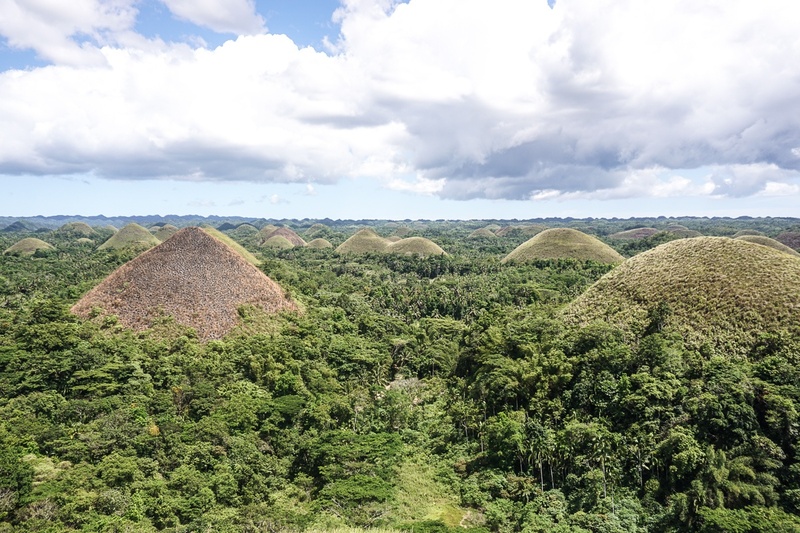 The best Bohol tourist spots are on the main island, where the famous Chocolate Hills are located. 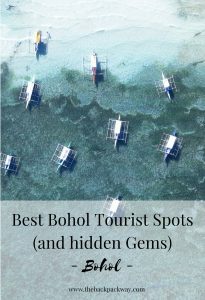 However, there is so much more to see and do on Bohol. 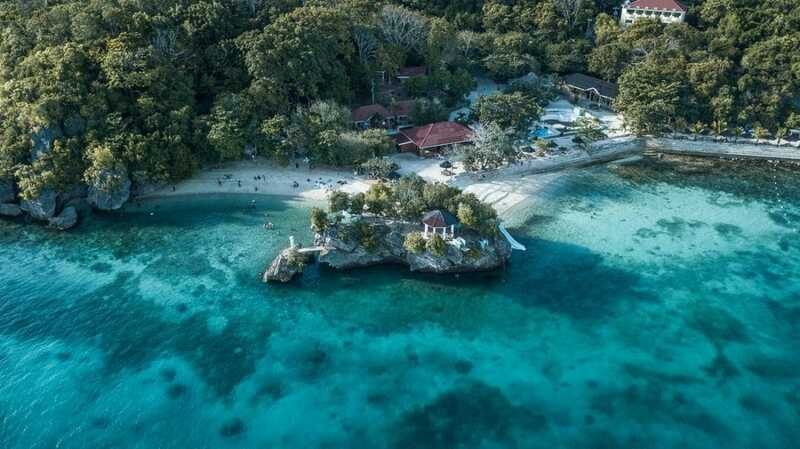 We put together a list of the best Bohol tourist spots including the top restaurants and where to stay for your perfect Bohol experience. There are several options on how to get to Bohol. You can either arrive by sea or air. Heading to the Philippines from abroad the 2 common airports of arrival are Manila, the capital of the Philippines, or Cebu. Besides being the biggest international airport in the Philippines, Manila may also be the cheapest one to arrive, depending on your starting point. 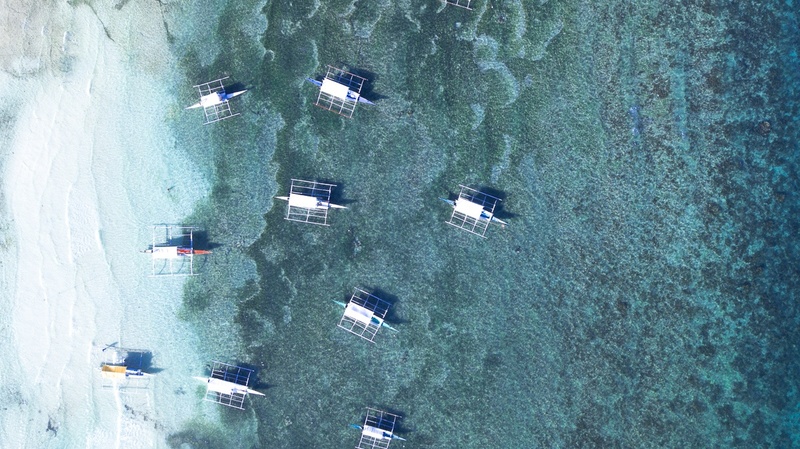 With Manila being the most densely populated city worldwide it definitely is the most turbulent place to start your vacation in the Philippines. From Manila take another airplane going to Cebu and further by ferry or take a direct flight to Tagbilaran, the capital of Bohol. A new airport is under construction on the Bohol peninsula Panglao (Panglao Island International Airport) and is intended to replace Tagbilaran Airport in the future. The second biggest international airport is located in Cebu, the oldest city and first capital of the Philippines. We chose Mactan Cebu International Airport to enter the Philippines, because of its central location. After arriving you can continue your trip by either taking another airplane or the ferry to Bohol. Tip: If you want to take the airplane to Bohol, make sure to not to arrive too late since the last plane leaves before sunset. For a special experience check the flight schedule of AirJuan. After arriving in Cebu take a taxi to the ferry port (Pier 1 for tickets). The taxi ride takes between 30 and 60 minutes, depending on the traffic. You need to know that there are 2 different kinds of taxis – the yellow and the white line. While the yellow taxis are the official airport taxis and are only allowed to take passengers from and to the airport the white taxis are found all over the city. Compared to the regular white ones, the yellow airport taxis may be a bit more expensive. However, all taxis are supposed to use the meter so it’s not that big of a difference. We took a yellow taxi to Pier 1 because the line for the white ones was way too long. In total, we paid 200 Pesos from the airport to the Pier. At the harbor, there are different kinds of ferries leaving to Bohol – the normal ferry or the fast ferries. Depending on the operator the regular ferry takes about 4h and costs between 195 (2nd class) – 475 (private room) Pesos. We recommend taking a fast ferry because it’s much faster (as the name already suggests) and it’s not that much more expensive but if you have time and want to save some money check the Regular Ferry Schedules for the timings. You will reach Bohol after 1,5-2 hours by fast ferry. It costs between 800 (Open Air / Tourist class) – 1.000 (Business class) Pesos. The standard Tourist and Business class have a (super cold) aircon so we suggest taking the Open Air Tourist class, which is upstairs and has a roof. The majority of the tours are offered by Ocean Jet but there are several operators. Get an overview of all the different operators. One thing you need to get used to while traveling through the Philippines by ferry is that every operator is charging separately. You will have to pay for your ferry ticket first, then pay a fee when entering the harbor and another for your luggage. There are several ways to get around on Bohol. Our suggestion is, as always, rent a motor scooter. It’s the most flexible, cheapest and definitely the best way to explore the island! Keep in mind not to rent at the most touristy streets. If you have time explore the area and look out for cheap scooter rentals. We found one which rented scooters for 300 Pesos a day. Other options how to get around on Bohol are the Tricycles or the Jeepneys. 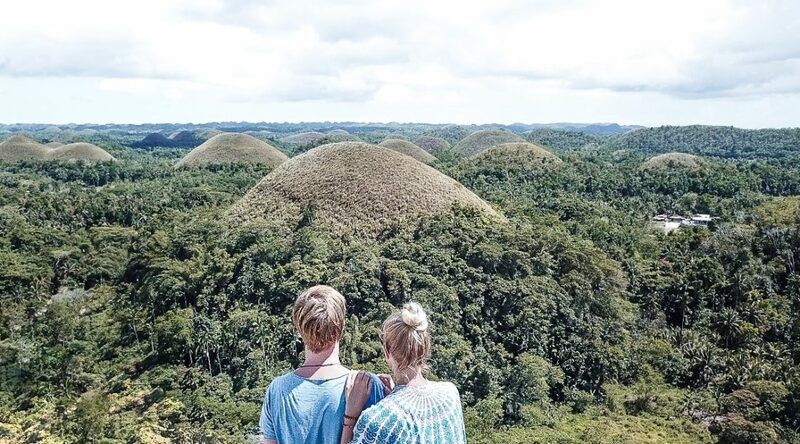 The famous Chocolate Hills are located in the heart of Bohol island and why most tourists come to Bohol. Legend has it that the formations were created by giants. Our favorite one says that the hills appeared after 2 giants had a long fight. Throwing rocks and stones at each other. After fighting for days, both of them were exhausted and had forgotten what their fight was all about. They put aside their anger and became friends. Walking away happily, they forgot to clean up the mass they had made – the Chocolate Hills. When driving to the viewpoint you already pass a few of the smaller hills. Enjoy the ride because once arrived you won’t have a lot of space to yourself. To be honest we enjoyed the legends more than the view over the actual hills. On your way to the Chocolat Hills, you will drive through the Man Made Forest. A forest that only consists of Mahogany trees. 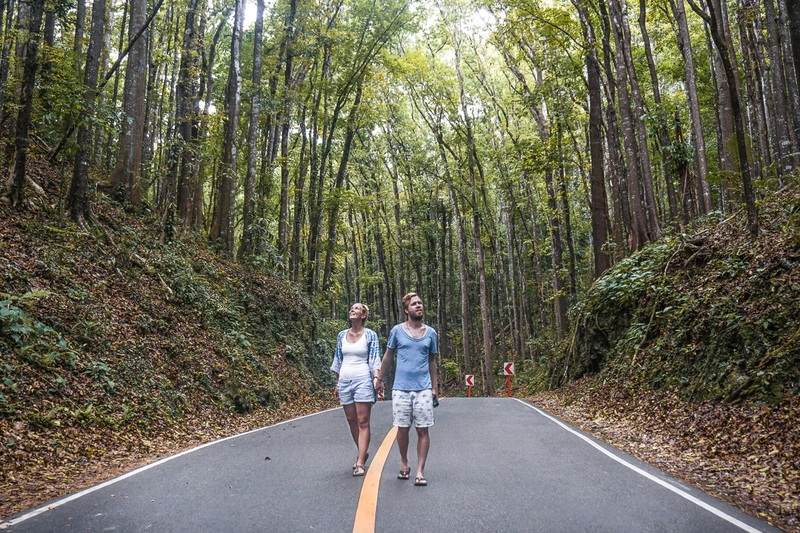 You will feel like you entered a different world driving from the typical Bohol forest into the Man Made Forest. The temperature changes as well as the sounds. Because of their height, the Mahogany trees usually don’t let the sun in and it rains a lot more in the Man Made Forest than in the surrounding area. Another mystical experience is the change of the sounds. There are almost no animals to hear. Some say the local animals are not used to the Mahogany trees and thus avoid them. Perfectly aligned next to the road this forest is a must stop for all the day tourists. 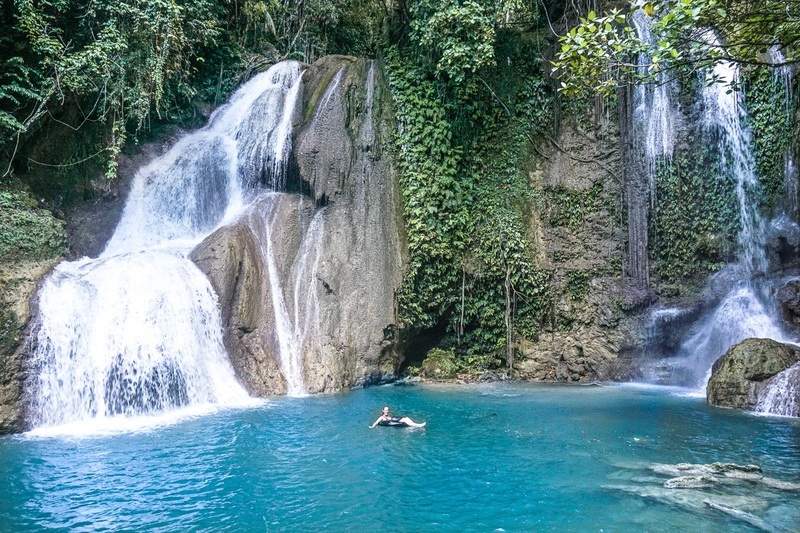 If you love waterfall hunting then the Philippines are the perfect destination for you! 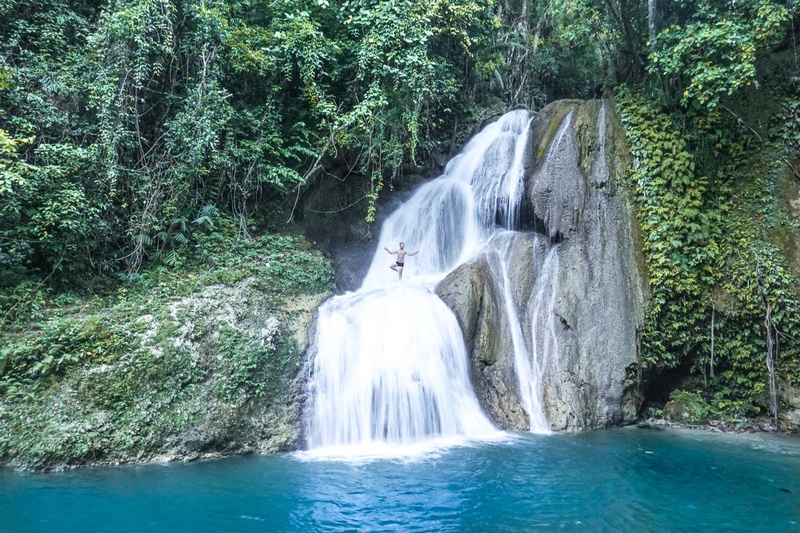 Bohol itself has plentiful stunning waterfalls. Our favorite are the Pahangog Falls (also called Dimiao Twin Falls). 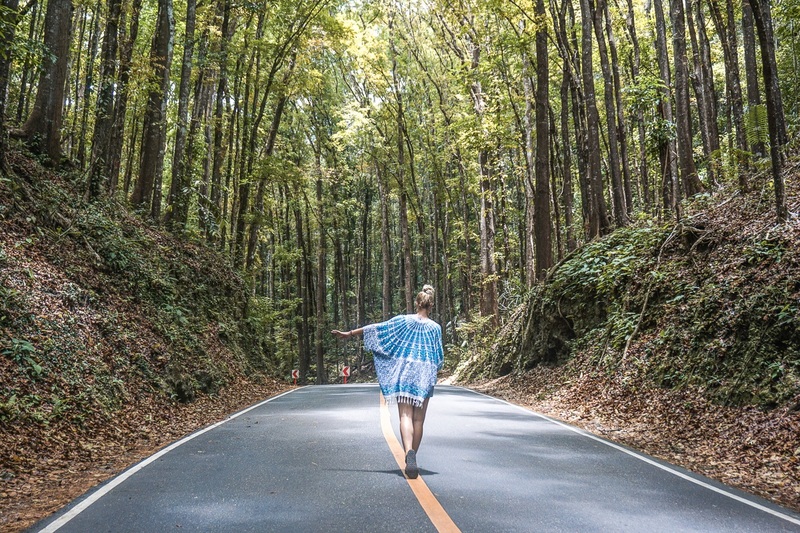 You can drive with your scooter until you reach a bumpy road leading directly to a small hut. Then you walk down the stairs until you see the falls. We visited the Pahangog Falls in the afternoon. The best decision you can make! When we arrived there were mainly locals enjoying a refreshing swim and having picknicks. They had quite a blast encouraging the few tourists to jump into the water from the cliff. One showed us the best spot to jump in and how to get in the middle of the waterfall. After an hour or so everybody left and we had the waterfalls all to ourselves. Right next to the water there are sitting areas made out of wood and you can borrow one of the tubes to relax in the refreshing water. We had so much fun with the locals and a very relaxing time after everyone was gone. The Tarsier is endemic to the Philippines, which makes the Sanctuaries super popular on Bohol. Tarsiers are the smallest primates with a measure of only about 85 to 160 mm. Their size in combination with their huge eyes makes them really adorable. Nevertheless, we decided not to visit them. Being a nocturnal animal it is their nature to live a mostly hidden life during the day. When visiting a Sanctuary the opening hours are (of course) during the day, which can cause a lot of stress for the tiny fellows. A big threat of captivity is the Tarsiers tendency to commit suicide – YES! Suicide! Camera flashes and being touched by tourists stresses the animals and might lead to their death. That’s why we opted for leaving the Tarsiers in peace. The magical spectacle of hundreds of fireflies illuminating the sky lures many tourists to do one of the fireflies tours on Bohol. The huge amount of the shiny beetles is related to the Mangrove trees, which provide nutrients and food. Bohol offers different options for watching the fireflies. You can for example book a kayaking tour or board a pump boat driving along the Abatan river. The most famous beach on Panglao is Alona beach. You find plenty of bars and restaurants along the road to the beach and one diving center next to the other. 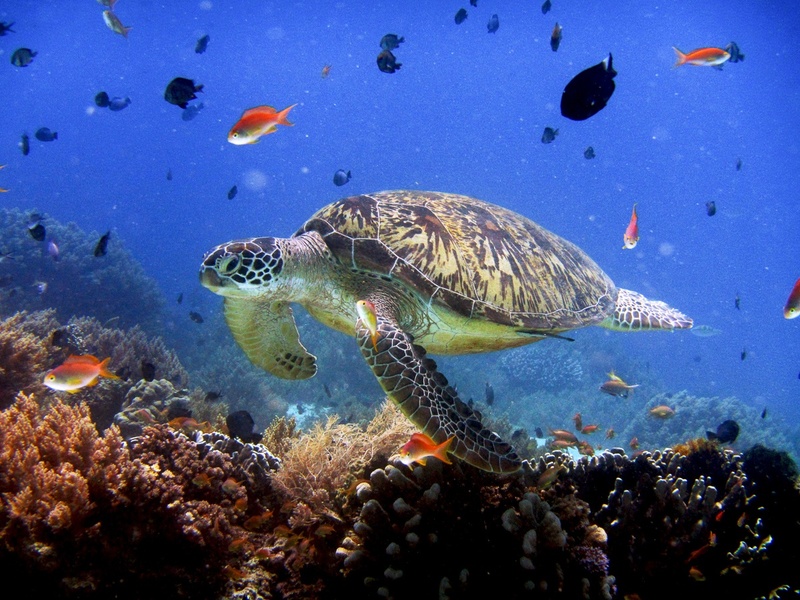 Panglao is amazing for your diving experience. Julia made her PADI Open Water license on Bohol, at the Sierra Madre Diving Center. 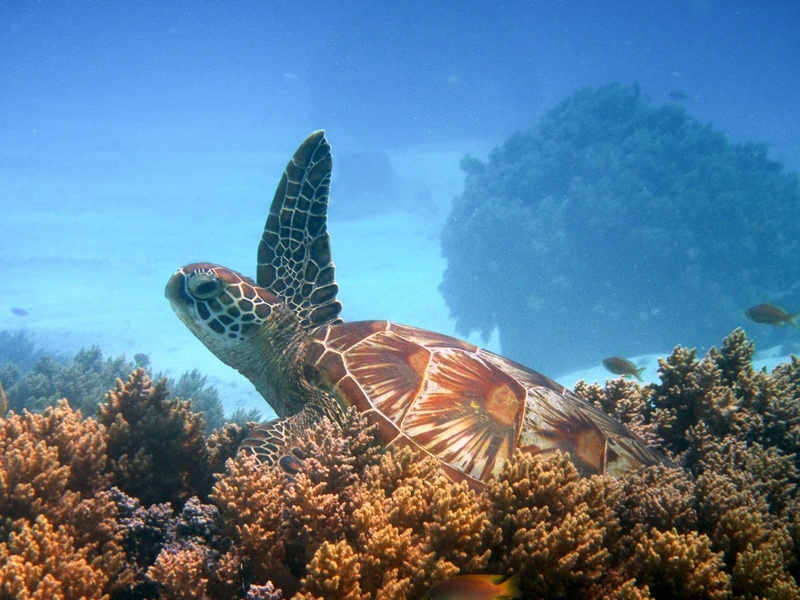 We had the most incredible encounters with turtles around the island of Balicasag and saw countless corals and beautiful fish. 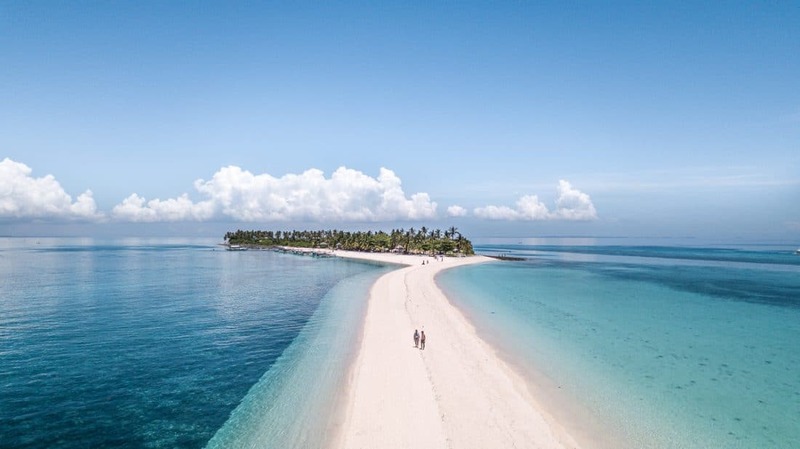 In the south-east of Panglao you find the most beautiful beaches on the island – Dumaluan and White Beach. The white beach front is mostly occupied by locals and you will always find a spot to yourself. Contrary to Alona beach it’s not crowded with divers and one restaurant next to the other. The ocean is incredibly clear and perfect for a peaceful day at the beach. However, keep the tide in mind. Low tight starts in the early afternoon. We had 10 days on Bohol because Julia was doing her scuba diver certification, but in our opinion 2-4 days are the perfect amount to explore the best Bohol tourist spots. 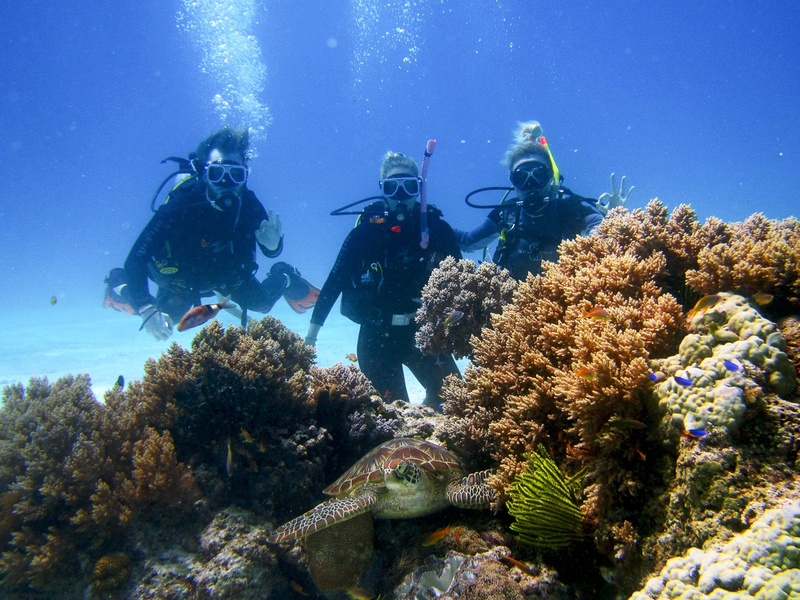 If you want to go on a few fun dives we recommend to add 2 more days to your Bohol experience. You will definitely find many restaurants at Alona beach and along the road leading to the beach. Nonetheless, we do recommend to drive a little further to get really delicious food. They serve amazing vegetarian Italian food. The veggie lasagne and the Tiramisu are to die for! Bali vibes in the middle of the Philippines. The smoothie bowls are delicious and the veggie burgers amazing! Run by an Italian the Pizza tasted as perfect as expected as well as the homemade Mozzarella. Sadly, the Tiramisu could not really satisfy us. Panglao is where you will find most hotels and homestays. Since you can easily drive to the popular tourist spots located on the main island of Bohol it’s where we recommend you stay. We stayed at Martin & Ginas Bungalow which is a 3 min Scooter ride away from Alona Beach and would definitely recommend it. 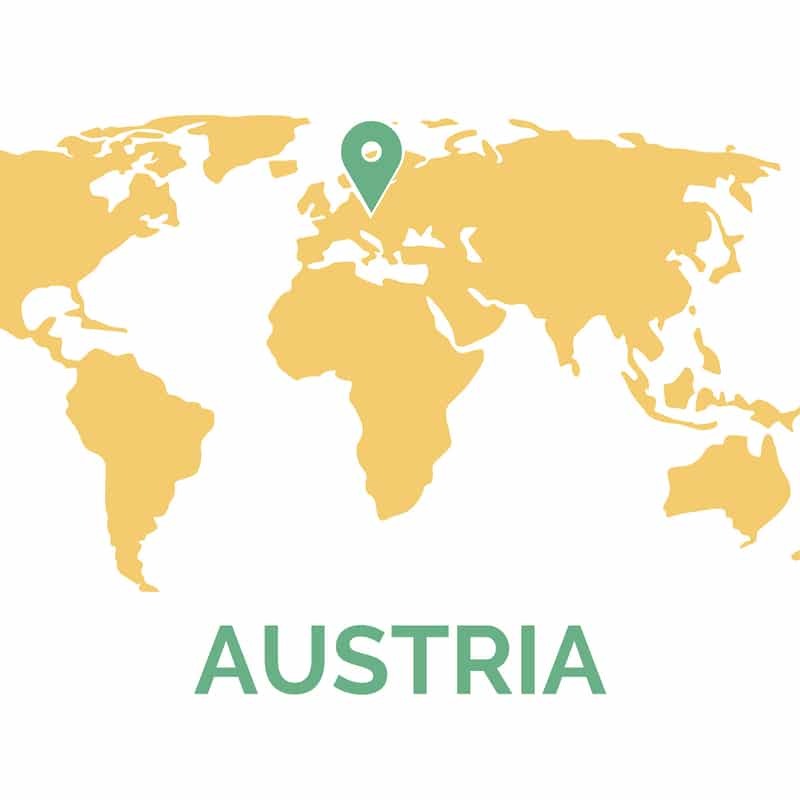 Get 35€ off of your first Airbnb booking. Check out Martins Airbnb here. Thanks for the tips guys, we’ll keep that in mind before heading there! 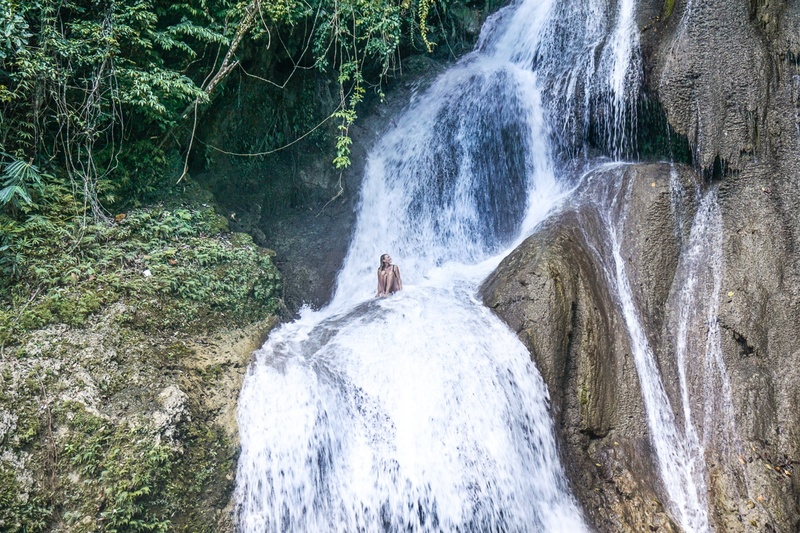 Bohol really is a great place for waterfalls! Wir lieben das Wassermelonen Pic! Ja, das Wassermelonen Foto ist auch eines unserer Liebsten von Bohol!